Thai Soul would like to present the traditional Thai Massage & Spa directly from experienced Thai people who have high qualifications in this field. Our services contribute to a variety of demonstrated health and lifestyle benefits, and we pride ourselves on creatings a relaxing and soothing atmosphere for our customers that makes them feel as if they are actually vacationing in Thailand! To find out more about the holistic benefits of Thai Massage click here. We offer new promotions every month, updated on our website, stay updated so you don't miss out! We are also proud to have one of the most diverse service offerings available in Melbourne, with demonstrated quality of service for the cost. We always take care of our customers with Thai service in mind, friendly faces linking the business to - The land of smiles. To see our treatment offering please click here. Click below to see all of our locations. I love my Thai massage and usually I go for a female masseur but I suggest going with Aum (Masseur's name). He is the absolute best. Wow!!! what an amazing atmospher you have created. I felt like I was in Thailand. Thank you for taking such special care of me, I always look forward to seeing you. I feel netter when I leave...(Loved the traditioanl Thai massage!!) See you again soon. Thai Soul is the place to relax and remind yourself of a lovely place. I absolutely love it here. The place is clean ,the atmosphere so relaxing and the massage are fabulous. Thanks for wonderful experience. I found my massage (Remedial) to be of an excellent standard. The rooms are first first class. Its a very relaxing atmospher. I will be back for more treatment. It's a beautiful place. I felt like a holiday in Thailand. The place is very relaxing and and massage was fantastic. All the best!! The Hospitality and the professional application to the massage ,foot massage and facial treatment that I have experienced is far superior than anything I have encountered previously . Winney and her staff are simply manificent. "What a fantastic experience" There is no place like Thai Soul that compares in quality. The rooms are amazingly put together down to every last little detail and offer true Thai feel. I would have say Thai Soul is a 10/10 and I reccomend visiting for a mix of Traditional Thai massage and Relaxation massage (Soul Replenish). I am already looking forward to my next visit. 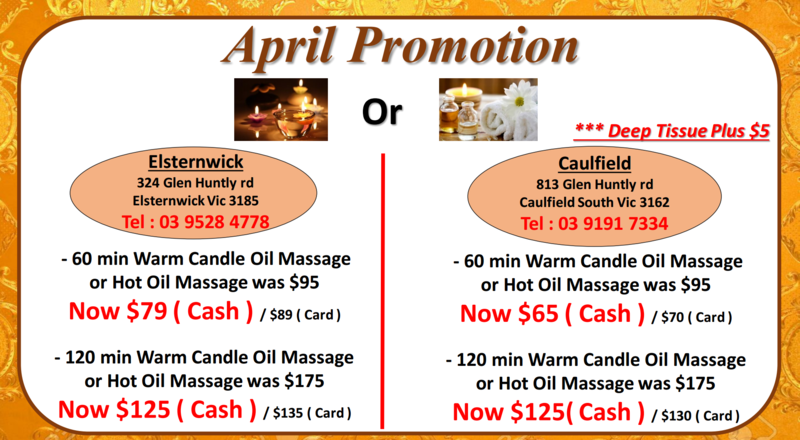 - 30 Soul Aroma Foot Massage or 30 min Ear Candling including head neck and shoulders.